Tons of local business owners turn to SMS marketing for affordable and immediate promotional solutions. 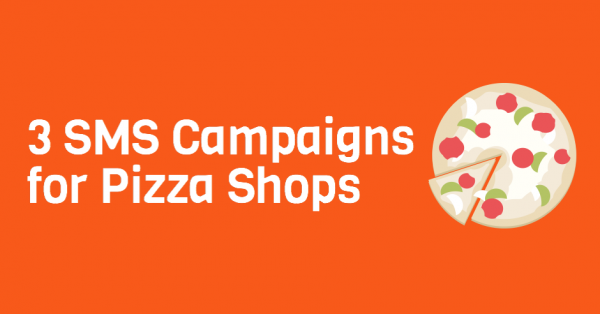 If you own a pizzeria, you probably don’t have hundreds to blow on marketing efforts. When attempting to encourage foot traffic and increase your bottom line, give these 3 SMS marketing campaigns a try. SMS marketing isn’t just for the busy times. Fire out mobile coupons during your off hours. If 12-4PM tends to be your slowest slot, run a deep discount. Push overstocked inventory, or discount a popular item. Then, watch as foot traffic drastically increases. EXAMPLE: Stop in 12-4PM today for one free 32 OZ soft drink with the purchase of any slice. Capitalize on game day fun and recreation with irresistible specials. Always give the people what they want. Go with the majority preference, and don’t make discounts too specific. For example, instead of discounting a double order of BBQ boneless wings, just offer a buy one single order, get one free special. This encourages offer redemption, and also offers subscribers incredibly qualified value. EXAMPLE: Hey Superbowl Fans! Text GAMEDAY to 31996 to redeem one free large pie with the purchase of any party pizza. Valid TODAY ONLY. Holding a special Game Day or holiday event? Give SMS marketing subscribers exclusive access. Remember, when promoting your SMS marketing list, always guarantee value and exclusivity. If you don’t provide those two core entities, you’re simply not making the best use of this mobile communication tactic. EXAMPLE: Show this text to receive front of the line access to this Friday’s local musician’s showcase. Partner up with top SMS marketing provider, Slicktext.com today. Give us a call at 1.800.688.6290 to sign up for your free plan. Not a text messaging pro? No worries. Our team gives you all the educational resources and learning tools you need to succeed.